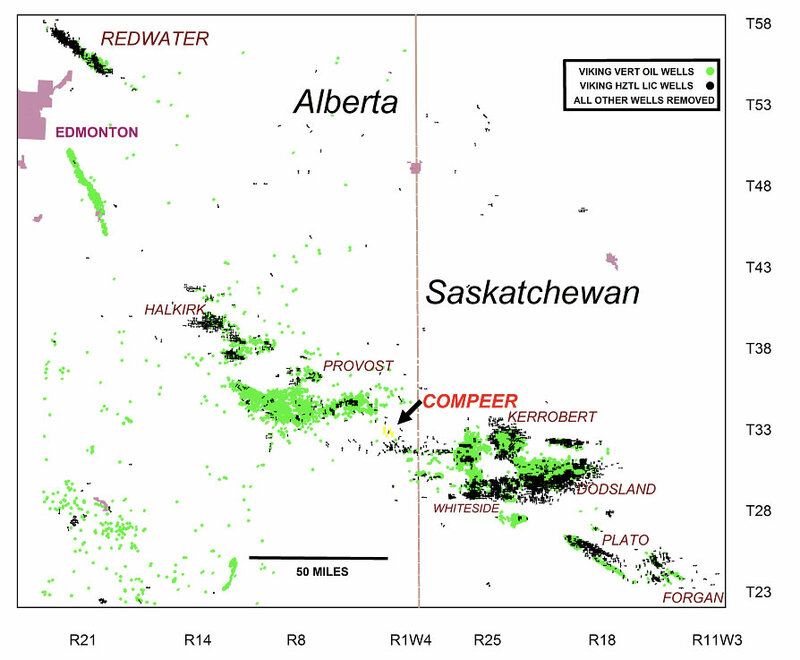 In June 2012, Fortem Resources earned an undivided 100% working interest in the petroleum and natural gas rights to eight sections of crown land in the Compeer Alberta area through the drilling of its first horizontal Viking oil well at 05-29-33-02W4. Big Lake Energy is also a wholly-owned subsidiary of Fortem Resources and operates in the Compeer-Viking oil play in Western Canada. The Compeer asset has 8 contiguous sections (5,120 acres) based on the Viking formation where light oil fairways extend from the Plato Field in Southwest Saskatchewan to the Redwater Field in Eastern Alberta. There are currently 135 horizontal oil wells drilled or licensed surrounding the Compeer land base, which 52 of said horizontal wells have yielded production rates of >50 BOPD (Barrels of Oil Per Day) within the first four months. The region has well-defined light oil (liquid petroleum with low density, low viscosity and low specific gravity) accumulations and is an ideal candidate for multistage fractured horizontal wells. The 05-29 well has been on production since February 2013 and the Company continues to monitor production performance. To date, immense activity has taken place by major companies such as Penn West, Apache and Baytex within a 5-10-mile radius. Big Lake Energy is encouraged that it has demonstrated Viking oil production across its Compeer acreage with estimated reserves of 2.7MMbbls, assuming a 5% recovery factor of 55.5 MMbbls Original Oil in Place (OOIP). The Company will continue to monitor its own well and the area activity to determine suitable next steps of its Compeer acreage.